James Biederman, installation. 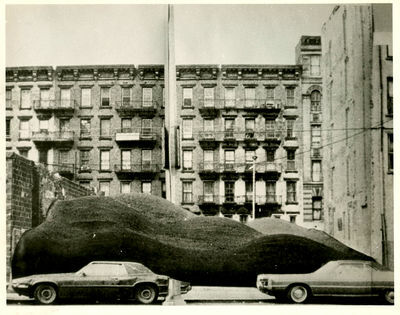 Artists Space, 1974. 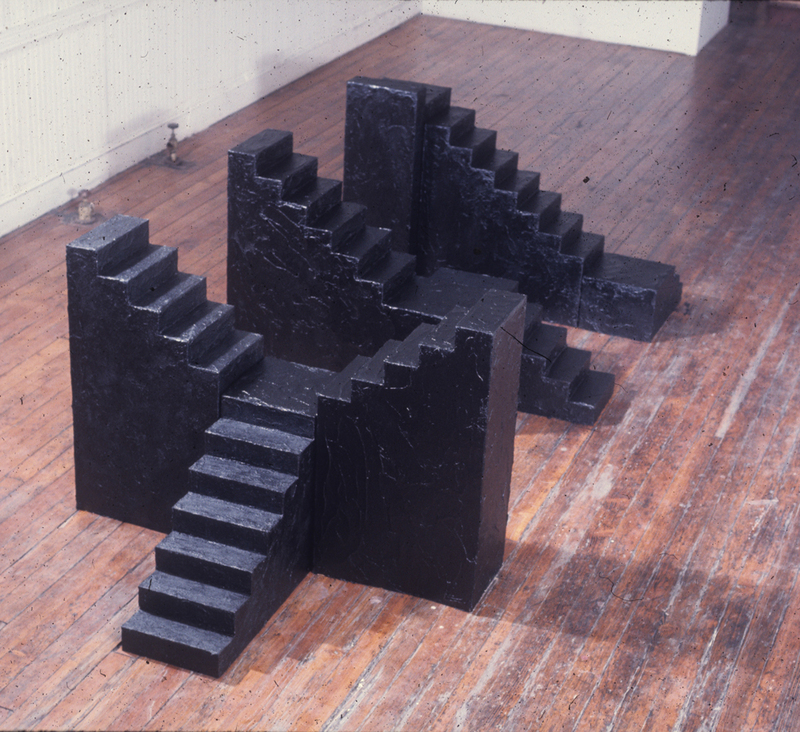 The three final shows of 1974, which included works by Thomas Lanigan-Schmidt, James Biederman, and Charles Simonds, were bound by an inclination toward the fantastic. 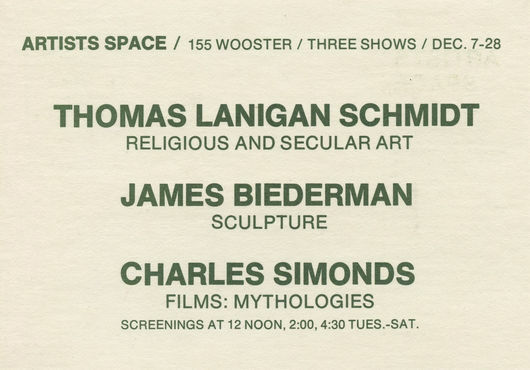 Thomas Lanigan-Schmidt, selected by Christo, exhibited a group of works under the title Religious and Secular Art. Lanigan-Schmidt had begun working several years prior with found materials and images to create glittering environments and objects melding sexual, social, and religious iconography. His work walked a line between light-hearted vulgarity and religious reverence, engaging with theater and play in a way that set it far apart from the late-minimalist and conceptual practices that garnered so much critical attention at that time. Both Charles Simonds and James Biederman were selected from the Unaffiliated Artists File. Simonds presented films of model-scale environments installed on the streets of SoHo. Similarly playful and mystical, Simonds’s piece used doll-sized figures and dioramas to gently tug at reality as passersby either noticed these micro-environments or walked on, oblivious. 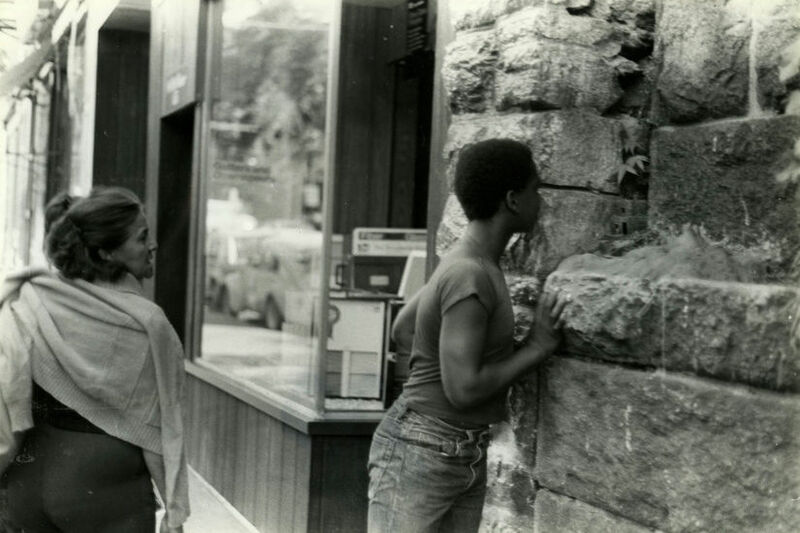 Their proximity to store windows draws them into a greater discourse on illusionism, since they themselves function as a window into a world at the same time that they share space with the viewer. Moreover, the space they occupy is highly specific, at the threshold of a public space and a commercial space. Meanwhile, James Biederman’s work featured three scaled-down, black staircases installed on the gallery floor. Obviously hand-made and resembling pieces of a stage set, they imply a world beyond despite their blunt presentation as discrete objects.